Kevin Bacon, Christopher Penn, and Lori Singer wear black high top, black low cut, and red high top Converse “Chuck Taylor” All Stars in the film. 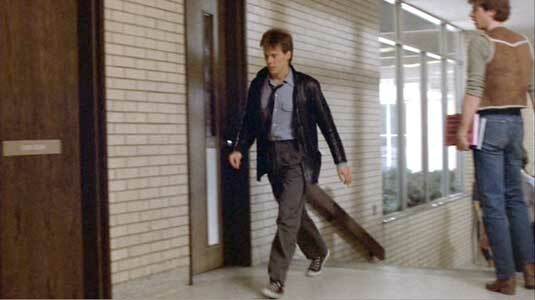 Kevin Bacon comes to the local high school dressed in style. Footloose is a rock musical about Ren McCormack (Kevin Bacon), a teenager from Chicago who moves to a small conservative Iowa town. Ren likes to dance and party, but this town is very straitlaced when it comes to accepting outsiders and the music and lifestyles that most teenagers lead. Moral leadership for the town is provided by the Reverend Shaw Moore (John Lithgow) who sermonizes against rock music and dancing because it will lead the youth of the town into a life of sin. Ren soon finds out that life in the country is very different from life in Chicago. Of course his daughter, Ariel (Lori Singer), turns out to be the most uncontrolled girl in town, and she hangs out with the wildest local redneck guy, as a rebellion against her father. However, she becomes intrigued with Ren because he is different from the locals, more worldly and knowledgeable about life on the outside. A triangle soon develops between the three of them which is the main subplot to the story. Ren is surprised to learn that the town actually has a law prohibiting dancing within the town limits. He makes it a cause to try to get the town council to permit the senior class to have a prom. Woody becomes friends with Ren. Ren does make friends with a local teen, Woody (Christopher Penn), who helps him to get acclimated to the town, and try to understand their ways. However, he can’t dance, and so one of Ren’s projects is to teach him to dance. Footloose and fancy free in the forest. The film is generally well acted, although full of the usual Hollywood clichés and stereotypes. For example, some of these people are so fanatical about suppressing “bad influences” that they actually have a book burning. I’m sure Iowans everywhere were “burned up” about that scene. Ren is of course challenged to the usual macho-man tests and fights, and is blamed for just about everything that goes wrong. And for a town that has tried suppressed all rock music and dancing, it’s amazing how well these kids dance when they get their chances. But if you ignore the attempts at sending the audience a message, Footloose is a pleasant rock musical with some good songs and dance sequences. It’s hard to race if you don’t lace. 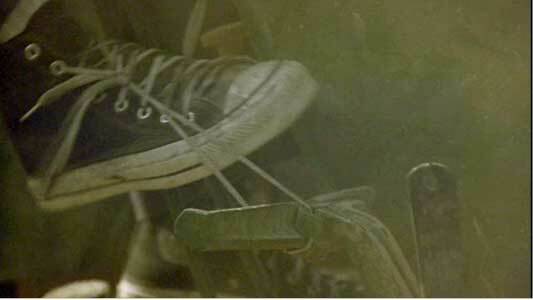 There aren’t a lot of chucks shots in the film. It would have been nice to see a pair of them as part of the opening “Dancing Feet” sequence, which just shows close ups of dancing feet, but you are denied. The closest it gets is a pair of beat-up canvas white Nikes. Besides some shots of Ren, who wears black high tops in a few scenes, you also see his buddy Woody wearing black low cuts in the gym, and a couple of scenes where Ariel wears red high tops. 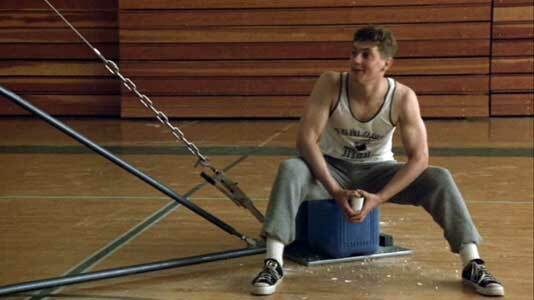 The best chucks scene has to be the tractor face off. Challenged to show up and face off by Ariel’s current boy friend (ironically named Chuck) or else be considered a wimp, Ren finds himself driving a tractor straight at his opponent. 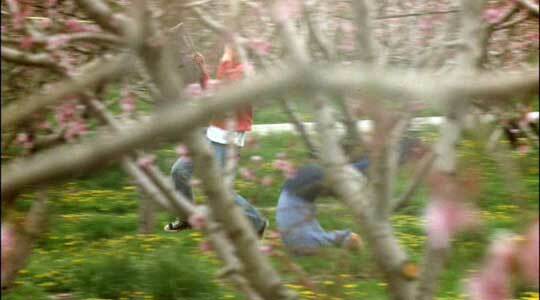 The person who “chickens out” first will end up off the road and in a drainage creek. Ren, who has never driven a tractor before, gets the shoelace of his black high top caught in the accelerator pedal, and in his attempts to free his foot, operates the tractor in a way that confuses Chuck, who eventually bails out and ends up in the water. Score: Chucks 1, Chuck 0. Something is “a-foot” at the local drive-in. 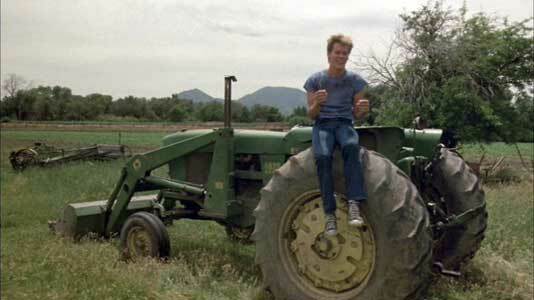 Footloose. (1984) Kevin Bacon, Lori Singer, John Lithgow, Dianne Wiest, Christopher Penn. Directed by Herbert Ross.